Monday - As I had use of a car I stayed in the office until going to five-a-side, meaning I arrived before everyone else had started playing. Perhaps it was due to the fact I wasn't rushing in to the hall but I thoroughly enjoyed myself and was very content with how I played. I only got one goal, but the rest of my play made up for it. I even got a compliment posted on Facebook for how I played! Wednesday - A day off from my full time job to steward a Rod Stewart concert at Shrewsbury Town's New Meadow. I arrived at 11:00 and didn't leave until gone 23:00, so it was a long day but very interesting to see some of the behind the scenes activities that go on - really different to a standard match day, and a world away from my usual job! Thursday - Not much to report other than I had to catch-up with things at work having been out for a day. Friday - I had to work from home so I could look after my little boy in the afternoon. I had to complete a task, which took a lot longer than I anticipated and it meant a later finish than I would have liked. Saturday - As we approached lunchtime, we decided we'd go out for lunch, initially to MacDonalds, but as there was a large queue we carried on to a Little Chef. Although the meals we had were nice, the service was relatively slow and we gave up wanting to order a dessert as no one came to take our order, despite my son stating loudly that he wanted ice cream! When we finished, we popped to Meole Brace retail park to do a bit of window shopping. Sunday - Nikki made it very clear that she wanted to get out and do something, so we ordered some tickets to the Birmingham Sealife Centre. After a pleasant drive in to Birmingham, we got to the Sealife Centre and spent about 2 hours walking round before ending up at Ed's Easy Diner under the NIA. Before heading home we decided to hear back into the Sealife Centred for another walk through. 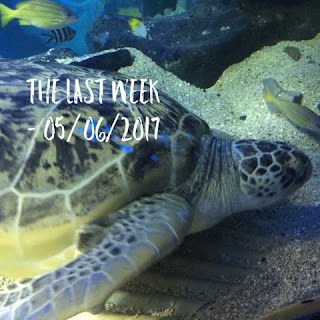 Even though we spent half the time in the aquarium second time round, I enjoyed it more as there weren't as many visitors so we could get closer to see the fish.